Based in County Mayo, Reiki & Bio Energy therapist Marian Trench has been successfully treating clients from Mayo, and beyond, for a variety of conditions including back pain for many years. Marian holds therapy clinics in County Mayo. She is passionate about people and their journey of discovery to healing & wholeness within themselves and thus their own lives. If you are suffering from any form of back pain or discomfort contact Marian today to make an appointment in her clinic in Mayo. I was introduced to Bio Energy through Marian early in 2009. At that stage I had severe pain daily and found day to day chores very difficult. I have been working with Marian regularly for the past eighteen months or so and my life has completely turned around not only is my physical health one hundred percent better, I am a far better person emotionally. I would like to take this opportunity to thank Marian for all her help and work it has changed my life so much for the better. Reiki is a Japanese technique for pain reduction and relaxation that also promotes healing. It is administered by "laying on hands" and is based on the idea that an unseen "life force energy" flows through us and is what causes us to be alive. If your life force energy is low, then we are more likely to get sick or feel stress, and if it is high, we are more capable of being happy and healthy. In Marian's Bio Energy therapy sessions her primary objective is to identify any energy disturbances by using a series of particular hand movements to scan the energy field within and around your body. Once Marian has identified and localised the energy blockages and imbalances she then begins to release these blockages by using another series of hand movements. This allows the life energy to flow freely throughout your body thereby relieving back pain. During the Bioenergy therapy session treatment Marian will go into greater detail including any necessary measures to be taken particularly with regard to your diet, exercise, rest and positive attitude amongst other elements. At the end of your treatment, you will be fully aware of what is needed in order to regain the full health and emotional balance which is rightfully yours. Marian's therapy sessions normally takes place on a one-to-one basis in a private and relaxed environment using a background of carefully chosen music that, over the years, Marian has found to enhance the treatment of back pain and other conditions. 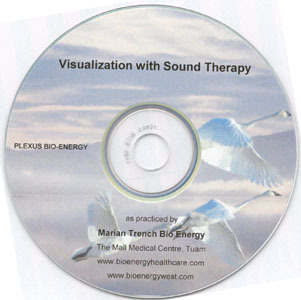 Marian has produced a Visualisation with Sound Therapy CD that will help you to work on your healing in the comfort and privacy of your own home. It is an ideal accompaniment for the therapies that Marian provides or as a standalone therapeutic aid.